The Darrabi Year 9 Pathways Program at Kambrya College is designed to re-engage students in the learning process to prepare them for entry back into the mainstream Year 10 course or, alternatively, provide a longer-term alternative learning pathway into Year 10 and beyond. Darrabi means “awaken” in the local Woiwurrung language. The choice of the name reflects the College’s belief that disengaged students are not bad students; they are simply students for whom an interest in learning needs to be ‘re-awakened’ to enable them to achieve success at school. Levels of student participation within the classroom is often hindered by resistance informed by the contextual pattern of disengagement within school. 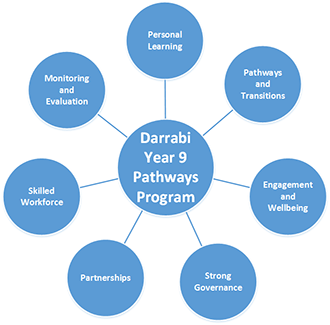 The Darrabi Year 9 Pathways Program attempts to break that pattern by emotionally engaging students, building their sense of self, community connectedness and emotional intelligence. The Darrabi Pathways Program still has a very strong educational focus, aligned with the Victorian Curriculum. The program seeks to include greater consideration of boys’ learning styles, involve students directly in learning activities through the inclusion of a series of projects, and to negotiate and discuss teaching and learning with the students.